I love the Copper Foil Sheets when used with these beautiful Paisley Framelits. They look like jewelry! TIP: I used a sheet of wax paper on top of the foil sheet when cutting. It makes it so much easier to remove the Foil Sheet from the Thinly I also pre-cut the Foil Sheet so as not to mark up the whole sheet when running it through the Big Shot. Pairing my copper embossed sentiment and leaf motifs with this beautiful print from the Petals and Paisleys Specialty DSP makes for a shiny and gorgeous card. Thank you for looking today! 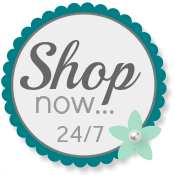 I hope you will use my Online Store for any orders you may have for your own creations!